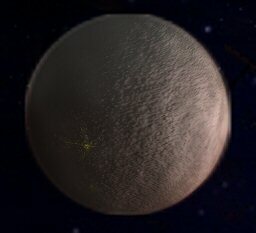 Alphaworld is the first planet in the A-W System (Alpha meaning "first"). 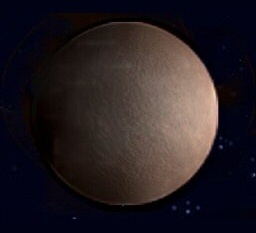 It is the largest known planet in astro-geographical records, and also bears the largest population. Most of the planet operates under an anarchic, self policed condition. Most communities that form towns are usually only a temporary leadership before slipping into anarchy again. The only thing close to resembling a global government in Alphaworld is Circle of Fire Corporation whom taxes "world citizens" for protection from outside forces. No payment - no protection. Because meteoroid activity is heavy in the A-W system, it is a generally reasonable fee. The corporation also keeps a watchful eye over the Alphaworld Peacekeeping Authority. 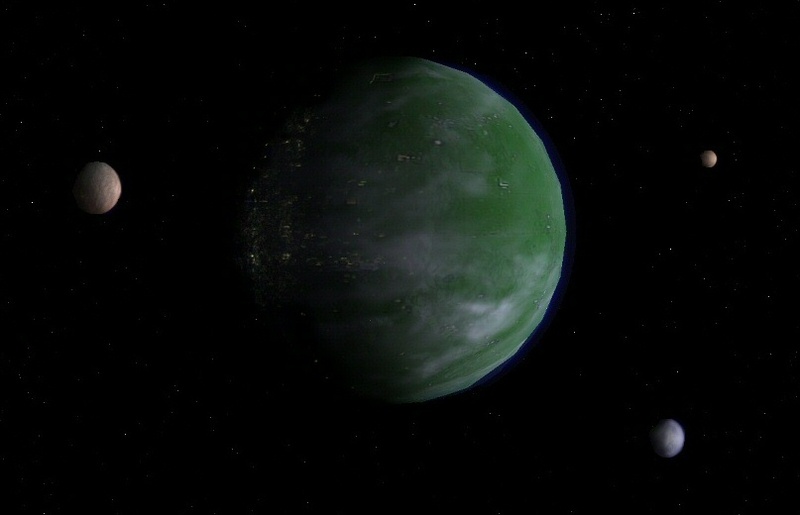 Alphaworld is a, relatively speaking, simple planet. Besides the rogue hill or river, it is mostly just a flat, grassland. 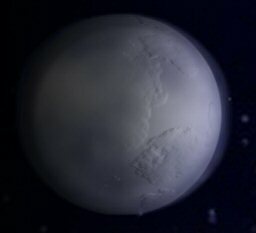 It has a temperate, consistent climate planet-wide and most every day is the same as the last. Alphaworld only has two seasons - summer and a short winter. Orbiting the planet endlessly are whispy cirrus clouds. Rain is rare in Alphaworld, but due to frequent high humidity conditions, water is returned to the ground via condensation (eg morning dew). Low profile plantlife such as sod have adapted to live off these trace amounts of water. In other 'greener' parts of the world, usually where civilization can be found, plants tap their roots deep into the ground where its moist from local underground springs. Most buildings and cities are only constructed along the planetary veins where the springs reside. The water teeters back and forth throughout the veins caused by the tides created by the three moons. The major veins are located along the longitude and latitude equators, and roughly halfway between them forming a web-like pattern, and all conjoin at what is known as the planet's "ground zero". Because of ground zero's significance, world navigation revolves around it. Ground zero is 0n 0w, and ascends outward from there with each unit representing 10 meters. Other planets have adopted this simple locational system, with their ground zeros bearing some sort of importance. Most inhabitants of Alphaworld construct their own dwellings and do so nearby other developed areas. As explained above, most civilization is around the planetary veins because they're used not only for drinking and food but also for hydro-power. Powerlines are rare and only constructed to create shared power zones which keep things more reliable for those who which to pay for that luxury. Common food sources include ranching and fishing. Farming in Alphaworld is rare by comparison, and most farm produce is targeted for the luxury food niche. Compared to other worlds, Alphaworld does not have very much variety in food, and because this, demands for new alternatives have rendered new technologies such as "lab ranches" like Genucon and concentrated hydroponic farms for non-indigenous flora.